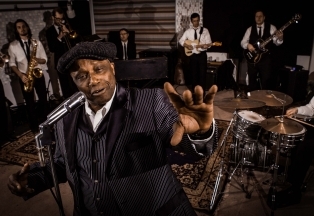 In the spring of 2013, Sonny and the Lakers hit the ground running – playing gigs a few short weeks after their first rehearsal. Within months they had grown into their own as a band. In the fall, they spent a long weekend at a cabin in Northern Minnesota and it became a defining moment. Staying up late, listening to old 45s, learning gospel songs, and wood shedding tunes was a way for the band to develop a similar vocabulary and refine their direction. It transformed them from a group of good players into a band. When they returned home, they set up a string of performances and residencies in Minneapolis and St. Paul. As they honed the craft of putting on a great live show, they built a following of fans. By the end of their residency at the Eagles club in South Minneapolis, virtually no breaks interrupted or slowed down their live sets. Non-stop rehearsals and live performances helped The Lakers tighten up their sound. That, coupled with the inspiration found during the cabin trip, laid the ground work for recording an album.